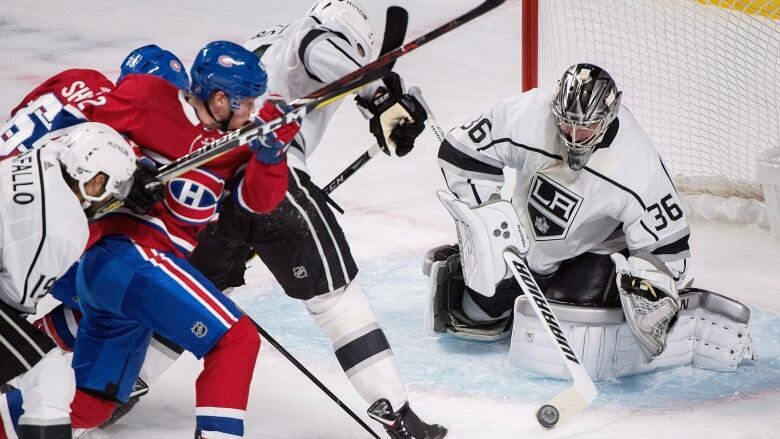 Jack Campbell made 40 saves for his first career shutout as the Los Angeles Kings blanked the Canadiens 3-0 on Thursday night to spoil Montreal's home opener. On a night when the Montreal Canadiens honoured the franchise's last Stanley Cup winning team, this year's Habs hardly played like champions. With most of the 1993 title-winning players in the building, Montreal was blanked 3-0 by the Los Angeles Kings in its home opener Thursday night. The Canadiens (1-1-1), who scored seven goals in their first two games this season, failed to create quality scoring chances despite outshooting the Kings 40-29. Most of those shots came from the perimeter. Carey Price stopped 26 shots for the Canadiens (1-1-1), who had scored seven goals in their previous two games this season. The Habs were shut out five times at home last year. 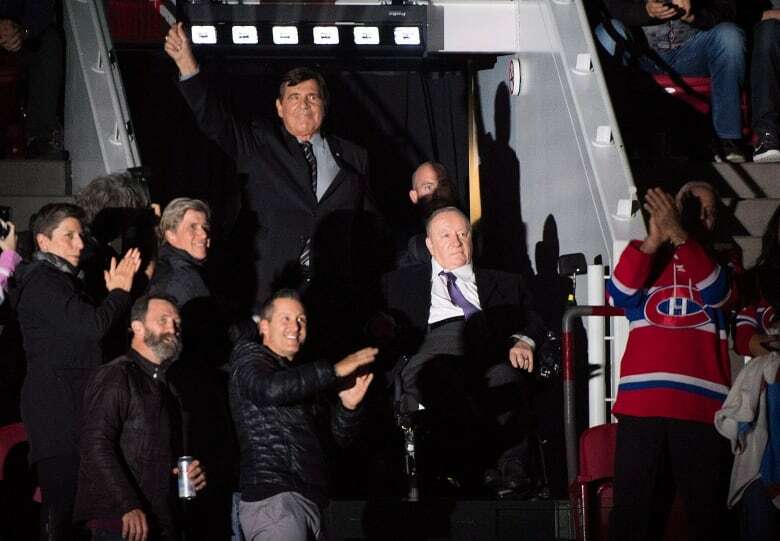 Montreal honoured the 1993 Stanley Cup-winning Canadiens team in a pre-game ceremony. Several players were in attendance, such as Vincent Damphousse, Guy Carbonneau and Patrice Brisebois. General manager Serge Savard and coach Jacques Demers got the loudest ovations. The '93 Habs — the last Canadian team to win the Stanley Cup — defeated Wayne Gretzky and the L.A. Kings in five games in the final. "We had a lot of possession but we're not creating high-end chances," said alternate captain Brendan Gallagher. "We're too stagnant right now. The puck needs to move quicker. We all understand that, we're just not executing that right now. Montreal's good opportunities were few and far between. Los Angeles' Jack Campbell stopped Max Domi from point-blank range early in the second period. He then stoned Andrew Shaw in the crease later that frame, just seconds after Tomas Tatar saw his shot ricochet off the crossbar. It looked as though Shaw had spoiled Campbell's shutout bid with nine minutes left in the game, but the Kings challenged the goal and it was overturned for goaltender interference. "We were throwing pucks on net, but weren't really getting any second chances," said Canadiens coach Claude Julien. "Their defencemen did a good job of boxing us out or clearing the rebounds. Could we have done a better job? Absolutely. Because we wouldn't be sitting here with a 3-0 loss. "We haven't played since Saturday and we looked a little rusty. Our execution wasn't there tonight." Campbell, replacing the injured Jonathan Quick who is day-to-day with a lower-body injury, stopped all 40 shots he faced for his first career shutout in his eighth NHL start. "They had 40 [shots] but we did a heck of a job all night," said Campbell, who got the game puck. "They have some real good skill and we limited their interior offensive chances. "Pretty cool, opening night, and the boys just played great." Montreal honoured the '93 Habs in a pre-game ceremony. Several players were in attendance, such as Vincent Damphousse, Guy Carbonneau and Patrice Brisebois. General manager Serge Savard and coach Jacques Demers got the loudest ovations. That team — the last Canadian club to win the Stanley Cup — defeated Wayne Gretzky and the Kings in five games in the final. But this year's Canadiens couldn't channel that winning spirit Thursday. After furious pressure by Montreal to start the game, Adrian Kempe scored on L.A.'s first shot. The 22-year-old first-round draft pick opted to shoot on a 2-on-1, beating Carey Price blocker side at 3:36. Michael Amadio made it 2-0 at 11:31 on a one-timer from the slot. The goal was set up behind the net by Jaret Anderson-Dolan, who recorded his first NHL point. Jeff Carter added a third for the visitors at 9:04 of the third period, a no-look shot where he slapped the puck on goal. Carter finished with a goal and two assists for the Kings (2-1-1), who are on a four-game Canadian road trip. "We came up a little bit short tonight," said Domi. "We had a couple of good looks but we need to capitalize. We need to initiate the middle of the ice. In games like that, that's where goals are scored. We have to find a way to get into those areas." Julien started the same players that beat the Pittsburgh Penguins 5-1 on Saturday, which meant Tomas Plekanec, Nikita Scherbak and Karl Alzner were again left out of the lineup. Plekanec is still sitting on 998 career NHL games.